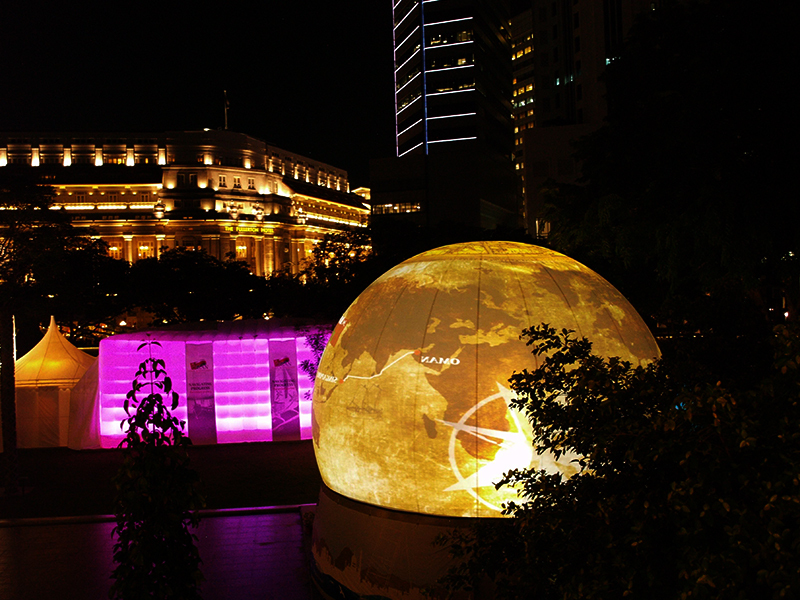 LM Production's Immersive, 360 degree video projection dome website: StratoSphere.info. On Stratosphere.info you'll find our whole product range, including custom made inflatable structures, technical information and details, case studies of past events and venues, testimonial, links to LM production's other services, features of projection domes and a short introduction of LM Production's team. This exhibition was built to feature Oman's ancient history, its present, and its future, through a series of interactive exhibits, photographs and immersive full dome films. The Exhibition was held at the Asian Civilisation Museum, in Singapore's trade and tourism district. The highlight of the Exhibition was the safe arrival of the majestic Jewel of Muscat; a working replica of a famous 9th century Omani ship, gifted to the people of Singapore by the government of Oman. LM Productions were commissioned to provide two inflatable structures for the Exhibition. The first was an inflatable Cuboid venue; a double skinned air supported structure, which housed a range of exhibits from Oman. This was linked via a covered walkway to the second structure; a 10m StratoSphere. The StratoSphere was used as an immersive cinema, in which audiences could watch high definition full dome video about the Omani Renaissance. LM Productions produced the 360 degree show from stock, found footage and archived material from Oman tourism.